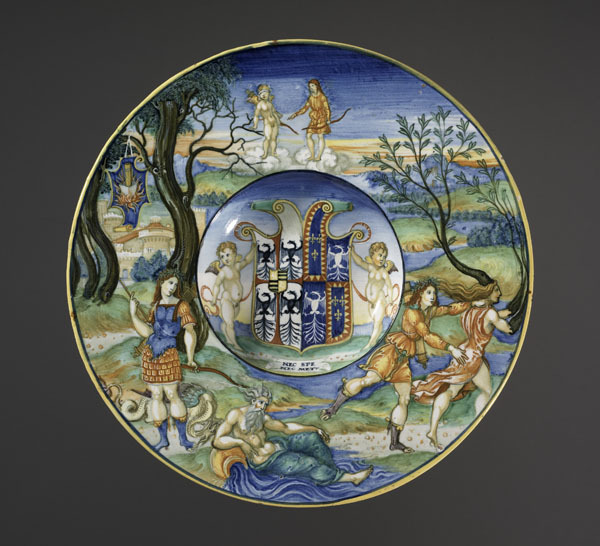 Isabella d’Este exemplifies the connoisseur patron who commissioned elegantly designed plates with illustrations of classical stories, indications of her familiarity with antique texts and her love of learning. 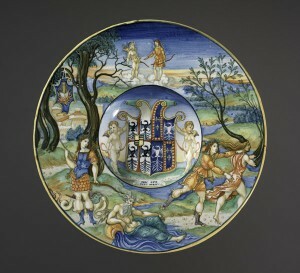 A fine example is this ceramic plate with classical allusions, made c. 1524–5 of maiolica—tin-glazed earthenware. It contains scenes of virtue that allude to the chastity of Isabella and the valor of her husband, Francesco Gonzaga (then deceased). In the center of the plate, two winged putti present the joined arms of Isabella and her husband above a banner that shows one of Isabella’s favorite personal mottoes: NEC SPE / NEC METU (neither hope nor fear). On the outer rim of the plate, concisely rendered vignettes provide a panorama of classical themes with pointed moral content. A connoisseur could demonstrate knowledge of antique material by commissioning maiolica plates that featured masterpieces of classical sculpture. A good example is this plate, dated 1539 on the reverse. 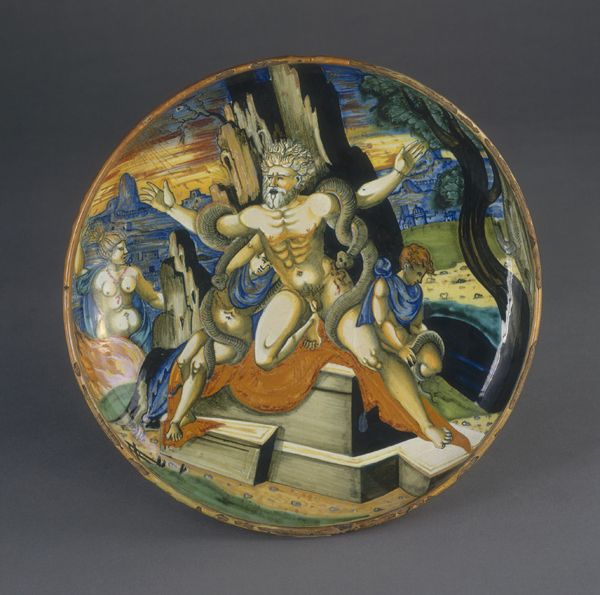 Against a vivid landscape the plate depicts the Trojan priest Laocoön. The Hellenistic statue of Laocoön had been unearthed to much acclaim in Rome in 1506 and later entered the distinguished and well-publicized papal collection of antiquities. Laocoön had attempted in vain to warn his people against Greek stratagems and was subsequently punished by the goddess Minerva, who sent monstrous snakes to attack both him and his two sons. The Laocoön was widely recognized as one of the most important sculptures of the ancient world. Displaying a painted image of the figure at the dinner table allowed the owner of the plate to demonstrate a knowledge and appreciation of this famous work. In the late fifteenth century, the glass furnaces of Venice began to produce glass vessels and plates, often in elaborate designs, which were also sought after by connoisseur patrons. A patron of extremely refined taste saw to it that his table was decorated with an object representing the most technologically advanced and aesthetically ambitious tableware of the day. He might, for example, commission pieces from Hermonia Vivarini, who had been granted a special patent to produce vessels in the form of ship.